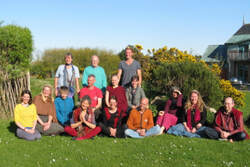 Togme Sangpo Buddhist Group in North East Scotland offers meditations, courses, pujas, and short retreats. We organise a variety of activities. There are weekend retreats, often with excellent visiting teachers. We host weekly Dharma classes on a wednesday night including meditation, teachings and discussions. These are accessible for all, both new and more experienced students and practitioners. For those with more experience you may be interested in monthly Medicine Buddha puja (ritual). Other events are organised, please check under "Buddhist Events" for details. Togme Sangpo Study Group is an FPMT Buddhist study group. FPMT stands for Foundation for Preservation of the Mahayana Tradition, under the guidance of Lama Zopa Rinpoche. FPMT study groups are groups which are using this status as a probationary period before a group becomes a legal entity and a full FPMT center. FPMT Study Groups are pending affiliation with the FPMT, and therefore do not have the same responsibilities as a centre financially or administratively. The FPMT is a worldwide organisation with around 160 centres, study groups and projects, providing high quality teachings, retreats, online courses and more. We are deeply honoured and grateful for this connection. Check http://www.fpmt.org, or the FPMT UK website fpmt.org.uk We are located in in the Findhorn area, Moray, Scotland, United Kingdom. Togme Sangpo (1295-1369) was the author of the 37 Practises of Bodhisattvas. He was renowned as a Bodhisattva in Tibet and revered for living according to the Bodhisattva ideals and practices that he taught. The text is a beautiful devotional poem in praise of the activities of Bodhisattvas, those beings whose loving-compassion inspires them to dedicate their lives to the service of others. It is also very practical: addressed to those who are inspired by the great ideal of bodhicitta – the resolve to engage in the path to spiritual realisation in order to be able to help all beings. When His Holiness the Dalai Lama taught in Glasgow in 2004 this was the text he used, so maybe this is especially appropriate for people living in Scotland! Currently the coordinating team consists of Margo van Greta, with Catherine Brislee, Tanya Reynolds, Katharina Kroeber, Mark Dammer. Coordinating team members are in direct contact with representatives from the FPMT on UK and international level, and participate in regional and European meetings. 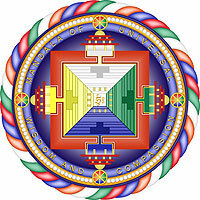 Vision: We encourage and guide all sentient being to enlightenment, benefiting humanity and the planet. Mission: Togme Sangpo intends to bring Mahayana Buddhist teachings and practises in the Findhorn area as part of the FPMT, integrating them in our own life and culture. We will organise Buddhist classes on both beginners and intermediate levels. There will be a program of regular classes and weekend retreats.